Are you looking for a product to help take up slack in your straight pull, inline rigging assembly? The turnbuckle is what you will need. 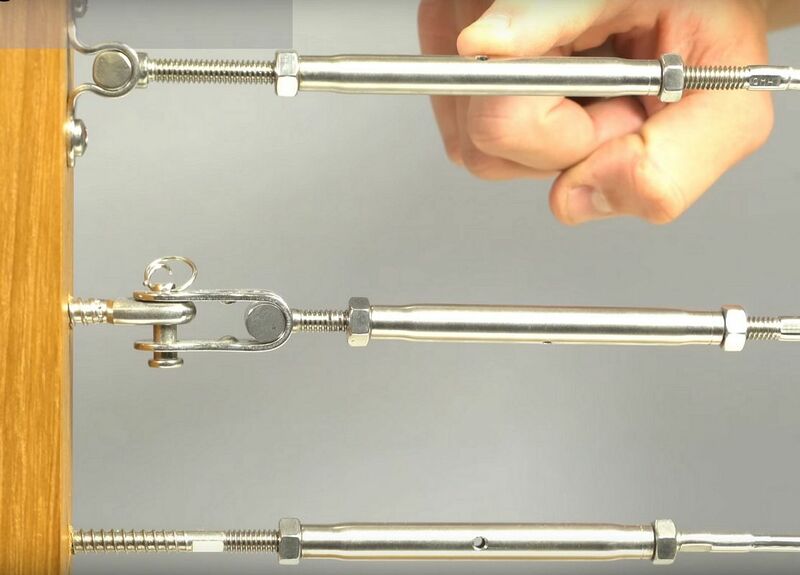 Watch our video explaining the different styles of turnbuckles and how to use them in your next project. If you prefer a text and picture version of the information, read more. Turnbuckles are used to take up slack and apply tension to a rigging assembly. They are designed to be loaded in straight pull, inline applications. They come in a variety of types, sizes, and coatings to suit many suspending, tie down, and tensioning type applications. 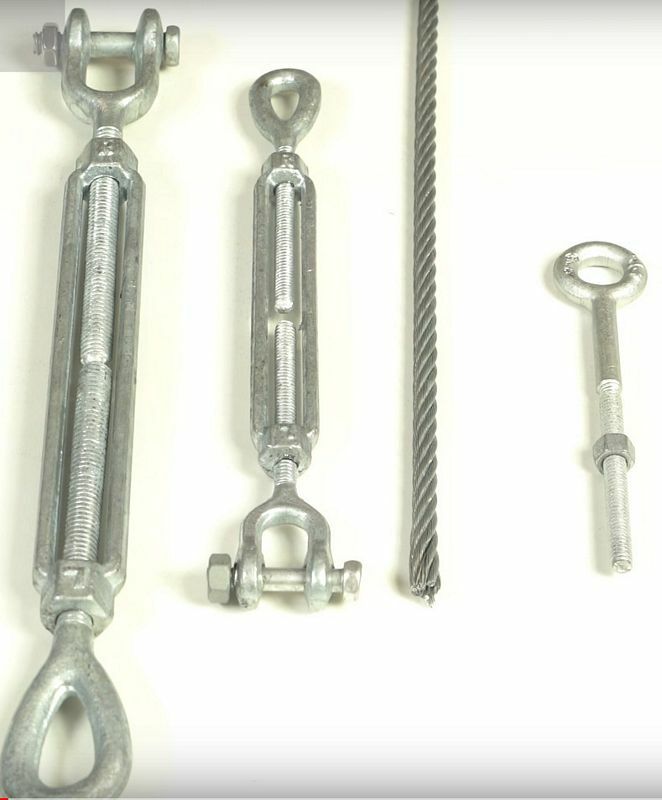 Turnbuckles are categorized by thread diameter, take up length, and end fittings. Thread diameter refers to the diameter of the threaded portion of the end fittings. Larger thread diameters will have a greater load carrying capacity than smaller thread diameters. 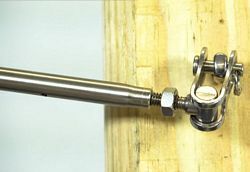 Take up refers to the total length that the end fittings can screw in and out of the turnbuckle body to take up tension. To increase the amount of total take-up capability in your system, either choose a turnbuckle with more take-up, or attach 2 or more turnbuckles together, in line. 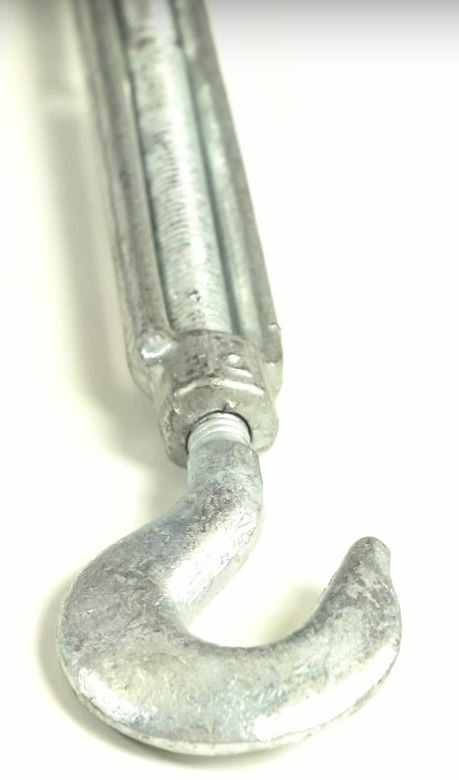 Turnbuckles can tension assemblies without twisting them up because one end fitting is left hand threaded and the other is right hand threaded. This design feature ensures only the turnbuckle body twists when tensioning. It is important to note that the working load limit should always be taken into consideration when sizing and matching turnbuckles to other rigging components. 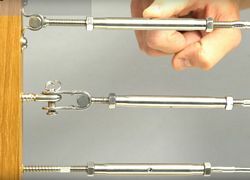 For example, a 1/4”x 4” turnbuckle has a much lower working load limit than ¼” cable or ¼” eyebolt, and the fittings may not connect easily. Up-size the turnbuckle to a size that more closely matches or exceeds the working load limit of the rest of the assembly or a working load limit that meets your loading requirements. E-Rigging offers typical turnbuckles with a selection of 3 different types of end fittings with each fitting having its own purpose, advantages, and disadvanatges. 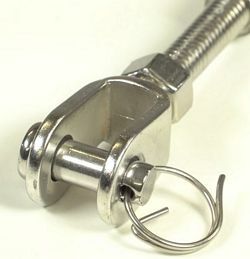 Eye end fittings are used with other components that can be opened and connect into the eye such as a shackle or quick link. They contain no moving parts and are the most cost-effective end fitting of the three. Jaw end fittings are composed of a jaw, bolt, and nut. 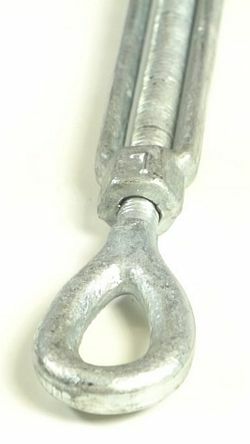 These are used to connect to other components that cannot be opened, such as an eyebolt or swaged sling eye. Depending on size, some jaw turnbuckles only come with a pin and cotter. You can find a list the of the components included with each jaw on our Turnbuckles page. 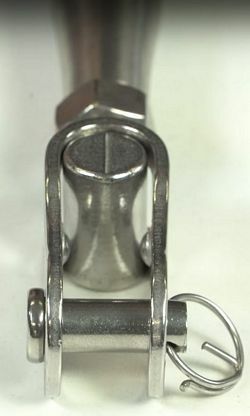 Hook end fittings are used for temporary connections and are easily attached and detached from other rigging components. 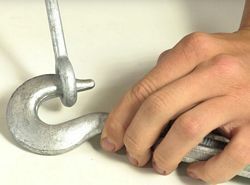 We do not recommend hook fittings in situations where tension can unexpectedly release from the turnbuckle as this may cause the hook to dislodge. Double check your fittings when using hook turnbuckles because the hooks are large and may not fit with other fittings having a similar working load limit. Toggle Jaw is a specialty end fitting which is available on some of our stainless-steel turnbuckles. It is especially useful when the turnbuckle must articulate in a direction that isn’t allowed by the other component used in the application. E-Rigging also carries a variety of Cable Railing Swage Turnbuckles which are used in cable railing systems. 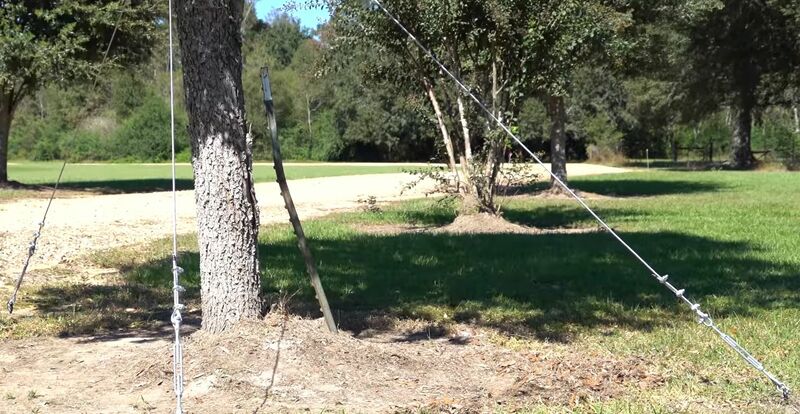 Visit our Cable Railing page and our YouTube channel for more information on these types. Our galvanized turnbuckles are drop forged. 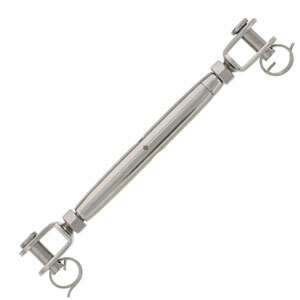 Our stainless turnbuckles come in both drop forged or formed and welded varieties. The formed and welded turnbuckles are nearly as strong as the drop forged turnbuckles, and offer significant cost savings. 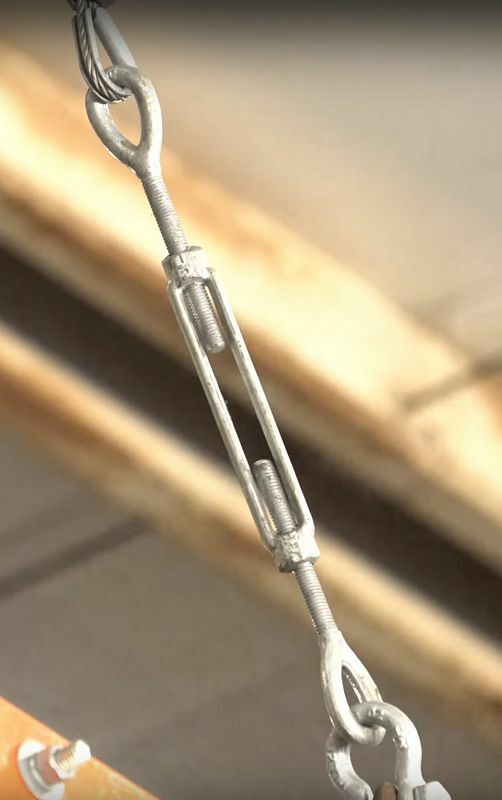 For critical applications that require stainless turnbuckles, the drop forged turnbuckles will offer better long-term reliability due to the end fittings’ elongated design that reduces stress and their superior manufacturing process. 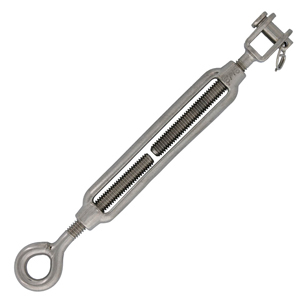 Our turnbuckles are made from hot dipped galvanized steel and type 316 stainless steel. For more information on coating types, please watch our video on YouTube or check out our Blog. Ideal for use in or near saltwater environments where corrosion frequently occurs. The best choice when using other stainless steel components. They are not as corrosion resistant as stainless steel. 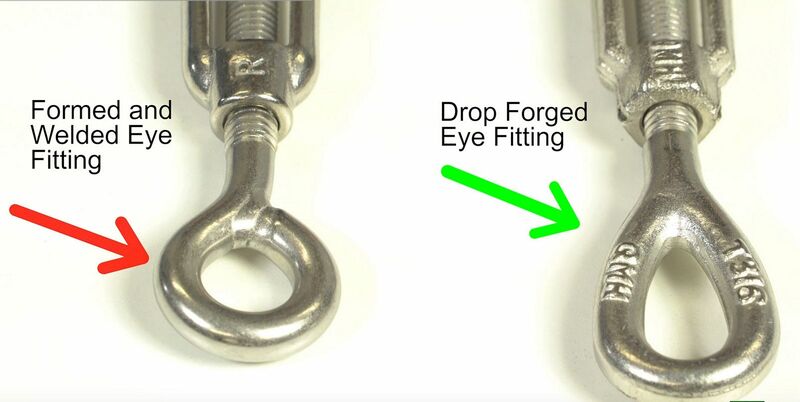 Unscrew the end fittings of the turnbuckle so that they are both fully extended. This can easily be done by unscrewing each end fitting one at a time until they are both equally extended. Unscrew the bolt from the jaw. Insert the jaw over the eyebolt. Then, insert the bolt back into the turnbuckle and fasten it tightly. Insert the eye into the opened shackle. Close the shackle so that the eye is locked into place. To tighten the turnbuckle, you can either use your hand, a screw driver, or a wrench to turn the body. Make sure to stop the end fittings from spinning with the turnbuckle body. This will prevent the screws from screwing in unequally. Tighten until your rigging assembly is tensioned to the desired point needed for your application. If your application will expose the turnbuckle to vibration, it is good practice to lock the end fittings from turning by using lock wire. This will prevent unwanted loosening over time. Your turnbuckle may also be equipped with lock jam nuts to prevent loosening. These can be used in non-critical applications, but are not recommended for critical applications as they put extra strain on the threads. For pipe style turnbuckles, a small screw driver or other small diameter type rod can be used to tighten the turnbuckle. Insert it into the hole in the body of the turnbuckle and turn to the desired tension. If you have any questions or need help choosing the products for your next rigging assembly, contact us. We look forward to helping you get your next project started.